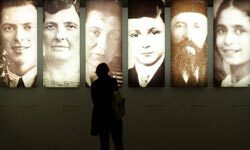 Interviews, readings and video on how the memory of the Holocaust, and the burden of that memory, remains a powerful shaping force in the cultural and emotional perceptions of today's young generation of Germans. Ursula Duba, a German-American writer, has researched and written about anti-Semitism and German-Jewish relations for 15 years. In this October 2004 lecture at Pennsylvania State University she recounts her disturbing experiences visiting schools in Germany and German schools in South Africa. She also talks about the silence within many German families about the Holocaust, and explains why she sees young Germans today as the victims of their own society. Excerpts from a documentary about the unlikely friendship between Arthur Lederman, a 100 year-old Holocaust survivor, and Christoph Erbsloeh, a young third generation German who was interviewed by producer Marian Marzynski. Teaching the subject of the Holocaust and the Nazi era is mandatory in German schools and in addition to the classroom curriculum, almost all students have either visited a concentration camp or a Holocaust memorial or museum. However, as German educator Lars Rensmann points out, there are limitations on how deep this education goes and how many young Germans it reaches. This controversy was triggered by a speech made by prominent German novelist Martin Walser in accepting the Frankfurt Book Fair Peace Prize in October 1998. Citing Germany's new Holocaust memorial, he condemned the "Holocaust industry" declaring that Auschwitz was being used as a routine threat against today's Germans. The speech sparked a firestorm of debate lasting for months. Here is a summary and one critic's rebuttal. A summary of the views of Jens Pieper, the 24 year-old editor of Nobody Asked Us, a recent book written by a group of young "third generation" Germans who are students at Humboldt University. It represents this third generation's thinking on how the Holocaust should be confronted and remembered and why they have declared their distance from how their parents and grandparents' generations have dealt with the crimes of the past. Wolfgang Thierse, president of the German Parliament, was a driving force in Germany's decision to build a new national Holocaust memorial in Berlin, unveiled in May 2005. 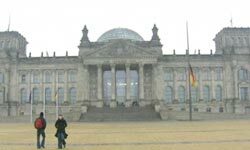 In this 2003 speech he talks about why commemorating the Holocaust will forever be an ongoing process because of Germany's struggle with memory, guilt and responsibility. But in the end, he believes there has to be an institutional response to the Holocaust in the name of all Germans - Holocaust memory can't simply be entrusted to the individual, as the third generation of young Germans proposes.